Following the second CiteAb Antibody Awards in January this year we will be profiling some of the winners here on our blog. Today we’re focusing on validation, an issue very close to our heart, and one that is topical following our announcement last week about our involvement in the 2nd International Antibody Validation Meeting. 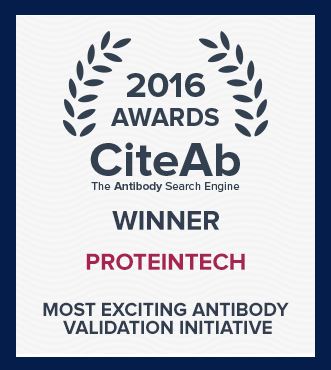 The winner of our ‘Most exciting antibody validation initiative’ category in this year’s awards was Chicago based company Proteintech. Proteintech emphasise the development of antibodies from whole proteins, and aims to provide researchers with unmatched reliability and reproducibility. Founded by scientists in 2001 after their continued frustration with failed experiments due to low-grade antibodies, Proteintech states that it is on a path to foster better science by producing the highest quality antibodies for every known human protein. Proteintech won the ‘Most exciting antibody validation initiative’ award on the back of its tireless work to raise industry standards through its siRNA validation programme. When judging entries to this CiteAb award, Michael Markie, associate publisher of F1000Research said: “Proteintech have made it their goal to lead the way in raising validation standards through validating their antibody products using RNA interference (RNAi) technology. This addition will nicely complement the wide-ranging validation data of their antibodies and should allow the scientific community to make a more informed decision about the quality of a specific antibody they may want to purchase”. Proteintech makes each one of its 12,000+ products in-house from start to finish, and implemented the knockdown method of validation starting in 2014. In December 2015, the company announced plans for the rapid expansion of the program to result in its entire portfolio being verified by this advanced technique over the next several years. Proteintech also recently announced an extension of its Antibody Exchange Program, which allows a scientist to swap any competitor’s failed antibody for the equivalent from the Proteintech catalogue at no charge. The initiative will now continue in the U.S. until June 30, 2016. The Antibody Exchange Program is open to both new and existing customers, even those who have previously participated in the exchange. Interested individuals are encouraged to visit abexchange.ptglab.com for more information. Proteintech will add the technical specifications and validation details, including siRNA results, as the program progresses. For inquiries on the timeline for a specific antibody, researchers can contact the company’s Customer Support directly. Dr Andrew Chalmers, founder of CiteAb, said: “Here at CiteAb, the quality and reproducibility of antibodies is core to our mission. We congratulate Proteintech on their award win, and look forward to further innovations from a company taking this issue so seriously.